Actually, I think it never left. In fact, this outdates that good old American snake oil by centuries. It’s Qigong, and it’s here to save your life. The theories of ancient Chinese qigong include the Yin-Yang and Five Phases Theory, Essence–Qi–Spirit Theory, Zang-Xiang Theory, and Meridians and Qi-Blood Theory, which have been synthesized as part of Traditional Chinese Medicine (TCM). TCM focuses on tracing and correcting underlying disharmony, in terms of deficiency and excess, using the complementary and opposing forces of yin and yang (陰陽), to create a balanced flow of qi. Qi is believed to be cultivated and stored in three main dantian energy centers and to travel through the body along twelve main meridians (Jīng Luò 經絡), with numerous smaller branches and tributaries. The main meridians correspond to twelve main organs (Zàng fǔ 臟腑)). Qi is balanced in terms of yin and yang in the context of the traditional system of Five Phases (Wu xing 五行). A person is believed to become ill or die when qi becomes diminished or unbalanced. Health is believed to be returned by rebuilding qi, eliminating qi blockages, and correcting qi imbalances. These TCM concepts do not translate readily to modern science and medicine. Feeling stressed? Having trouble unplugging from your full — sometimes too full! — life? You might be looking for a simple practice that can help you find more balance… physically, emotionally, mentally, and spiritually. Or maybe your energy is low, you feel rundown, and you’re vulnerable to illness — or you have a chronic condition — and your go-to remedies and practices aren’t enough to turn things around. It’s time to take your health into your own hands. A daily Qigong practice, available to everyone, can immediately lower stress, increase energy, prevent illness, and support you in rejuvenating your body, mind, and spirit. With Qigong, you can learn to bring healing energy — known as “Qi” — to particular parts of your body to transform anxiety, stress, and disease into self-confidence, inner peace, and optimal health. As your body responds by doing what it’s designed to do (heal and re-balance itself), blockages in your flow of Qi disappear and your full life force energy moves smoothly, radiating out into all aspects of your daily life. During The Qigong Global Summit, some of the world’s foremost Qigong teachers — including Master Mantak Chia, Daisy Lee, Lee Holden, Dr. Effie Chow, Dr. Roger Jahnke, Master Mingtong Gu, Pedram Shojai, Sifu Ama Lia Wai Ching Lee, Robert Peng, and others — will show you simple yet powerful practices to cultivate abundant Qi flow for your health, healing, and daily life. These Qigong teachers, masters, and doctors in the first-ever Qigong Global Summit will share insights into the practices of Qigong, Tai Chi, Martial Arts, and Traditional Chinese Medicine — as well as how Qi is the foundation of all of these ancient arts, and more. Through beautiful, high-quality video, they’ll illuminate both the philosophical and practical components of working with Qi — and offer simple practices you can use right away. Our highly esteemed teachers will offer their wisdom on how to discover your inner healing potential, and perspectives on how to flow with the challenges of daily life. Believers of qi (chee) describe it as a vital energy whose flow must be balanced for health. Qi is a pseudoscientific, unverified concept, which has never been directly observed, and is unrelated to the concept of energy used in science (vital energy is itself an abandoned scientific notion). You may have heard the words “qi” or chi” with regard to acupuncture and alternative medicine. But do you even know how to pronounce it, let alone understand the concept? If you’ve ever wondered: “What is (qi) chi energy?” then read on. Understanding this important concept will help you better comprehend how Traditional Chinese Medicine and acupuncture work. Qi or chi — pronounced “chee” — is the energy flow created along the pathways that connect the acupuncture points on the body. The pathways between the points are called meridians, which also connect to internal organs in the body. Using acupuncture needles, pressure or heat to manipulate a point or two separate points on the body can improve a person’s qi — which is also thought of as one’s life force — and relieve the symptoms of a variety of medical conditions, including chronic pain, digestive issues, respiratory problems and more. This understanding of the human body comes from Traditional Chinese Medicine, which is thousands of years old. It’s a different way of thinking about how the body works than conventional Western medicine. I was thankful to receive this particular piece of mail. It reminded me that foolishness is not not a modern invention. It is a human tradition that stretches back to the time when ignorance was an excuse. Coming next: feng shui. I guarantee, you’re going to love it. This is being cross-posted from the Skeptical Analysis blog. Max Gerson seems to have been a very self-reliant man. At an early age he found he could cure his own migraine headaches by controlling his diet, and as a medical doctor he found diet to be a cure for a multitude of other complaints. The list is impressive. According to the flier distributed by the Gerson Institute, the Gerson Therapy can cure or prevent: cancer, heart disease, strokes, diabetes, arthritis and “other diseases of civilization that kill and cripple us.” Just wait until the AMA hears about this. Max’s daughter, Charlotte Gerson, is living proof of the effectiveness of the Therapy. At age seventy, she looks the picture of perfect health. Slim and vigorous and very neat looking with white hair and wearing white sandals and slacks with a blue blouse and a string of pearls. She looks the way you would like your grandmother to look (or the way you would hope your wife looks at that age). You would never believe that 58 years ago her father cured her of “incurable” bone tuberculosis. Indeed, the only sign of malady she exhibited (that could not be attributed to seventy years) was a “Band-Aid” patch on the middle finger of her right hand. Charlotte’s free lecture was presented at the Unity Church of Dallas on Forest Lane. Prince Charles has never made a secret of his love affair with alternative medicine. Now he has infuriated the medical profession by backing a controversial cancer treatment which involves taking daily coffee enemas and drinking litres of fruit juice instead of using drugs. Charles gave an enthusiastic endorsement last week to the Gerson Therapy, which eschews chemotherapy in favour of 13 fruit juices a day, coffee enemas and weekly injections of vitamins. Cancer specialists have told The Observer that there is no scientific basis for the theory and that it can be dangerous because patients who are seriously ill often come off their normal treatment to try something unproven which may leave them badly dehydrated. The problem with scams like the Gerson cure is threefold: They don’t work. They entice patients to avoid therapies that do work. They are expensive beyond all reason and worth. For any and all of these reasons, avoidable death can be a consequence. Another of Charles’s associates, the hereditary peer and crossbencher Lord Baldwin of Bewdley, went to the Tijuana clinic in 1996 when his wife Sally was seriously ill with breast cancer. She spent eight weeks at the clinic, followed by another two years of using the regime at home. Her disease recurred and she died three years ago. Six years ago, [James Arthur] Ray wouldn’t run out of a kitchen unless it was to speak to thousands of people—or the audience had paid four figures each for the privilege. After being featured in the book and movie of self-help sensation The Secret in 2006, Ray was propelled onto the national stage. At the time, he was touted as the latest in a long line of prominent self-help gurus who claimed to hold the keys to living a happy and successful life. Two appearances on Oprah followed, as well as his 2008 New York Times best seller Harmonic Wealth: The Secret of Attracting the Life You Want. The price of joining Ray’s World Wealth Society—a program of one-to-one mentoring—peaked at $90,000, and he bought a luxurious home in Beverly Hills. A glowing profile in Fortune magazine dubbed him heir to Tony Robbins’s motivational-speaker throne. Then, in October of 2009, three of Ray’s followers died. The good news, depending on how you define “good,” is that in 2013 the resilient Mr. Ray was released from prison, having served his two-year sentence for negligent homicide. On that fatal day in 2009 two people died immediately from heat stroke and another died nine days later of “organ failure.” The victims were among approximately 75 people who offered themselves to Ray’s cure, submitting to temperatures of 200 F inside a tent heated by rocks. Back in business (as of March last year), Ray continues peddling “harmonic wealth.” It’s “the idea of energy fields attracting similar energy fields.” He will be successful so long as his dupes perform as scripted. He should not require much help. Mary Vonderscher of Burbank, California, thought faith healing worked. She felt cured of cancer of the spine, she said, even though doctors had thought her case was hopeless. Appearing on an Oral Roberts TV spectacular in mid- 1955, Mrs. Vonderscher gave a glowing testimonial. In January, 1956, relatives of hers in Indiana saw a re-run of this program-just three days before traveling to California for her funeral. Wanda Beach, another believer, was a thirty-seven-year-old diabetic from Detroit. In 1959, after telephoning her mother that Roberts had “completely pletely cured” her, she threw away her insulin. And died. Stephen Barrett. The Health Robbers: A Close Look at Quackery in America (Consumer Health Library) (Kindle Locations 4488-4491). Kindle Edition. Those are the opening paragraphs of Chapter 24 of a book by Stephen Barrett and William T. Jarvis. It’s titled The Health Robbers: A Close Look at Quackery in America, and I obtained a copy of the Kindle edition. I had the good fortune to meet Dr. Barrett 21 years ago when he was in Dallas to participate in the taping of a TV special on supernatural stuff. It’s one of the topics of interest to The North Texas Skeptics. One of the NTS technical advisors is Tim Gorski, M.D., at the time head of the DFW Council Against Health Fraud. Stephen Barrett is founder of the national organization, and Jarvis is the current president. I will be reviewing the book later this year, but in the meantime this column will carry some interesting case studies from Chapter 24. This was a topic for discussion at the January meeting on Saturday. I had previously posted the following on the Skeptical Analysis blog, and I’m re-posting it here for NTS members. 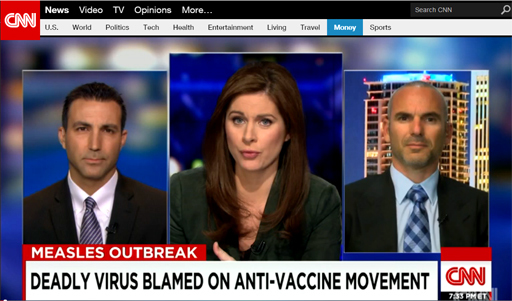 Thursday I caught a bit of Erin Burnett Outfront on CNN. She had an interview with Doctors Armand Dorian and Jack Wolfson. The conversation turned into a shouting match about the measles vaccine, or lack thereof. 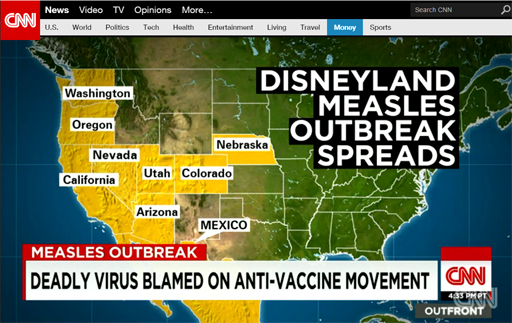 Owing to a number of people declining to be vaccinated for measles there’s been a recent outbreak of measles, particularly in areas rich with anti-vaccine sentiment. See the map. California is rife with vaccine craziness, which, unlike a lot of lame brain thinking, seems to cross liberal-conservative boundaries. 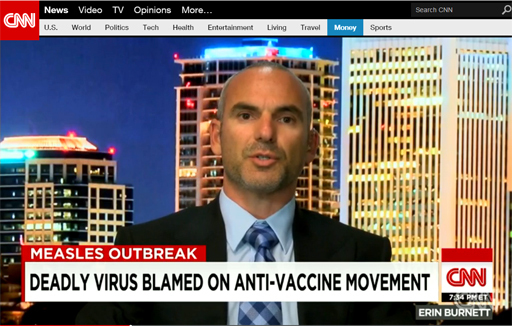 Wolfson, out of Phoenix, Arizona, seems to be one of those who refuse to recognize the heavier benefit of vaccination. His attitude, at least in this sector, seems to be for letting nature run its course. Dorian was aboard to counter a lot of Wolfson’s nonsense, but his wisdom generally got lost in the back and forth. I’m just going to highlight Wolfson’s comments, because stupid stuff is what this blog is all about. I transcribed the following from the video. There are likely mistakes in the transcription, but the gist is captured accurately. First, Burnett asks a question. Then, Wolfson responds. Burnett’s comments are in bold. Why are you opposed to the vaccine? What I’m opposed to is the fact that we’re injecting chemicals into our children. This aluminum, mercury, sometimes aborted fetal proteins. There’s antibiotics in there. We’re doing something that is totally foreign, that is totally unnatural to our children. We’re experimenting on our children. Our children have the right to get infections. We have immune systems for that purpose. As the doctor previously said, there were millions of cases, and rarely did anybody die from this. These are typically benign childhood conditions. We cannot sterilize the body. We cannot sterilize our society. We need to be affected by these viruses, bacteria. He states that he is a board-certified cardiologist. Whether it’s chicken pox, it’s measles, it’s mumps, rubella. Listen, there’s 70 people who have it right now. 80, whatever the number is. They’re not dying. These are benign childhood conditions that, once the child gets it, they will be immune forever. So, I’m thinking, “What do we need a doctor for?” You got a bad heart? Maybe it’s nature’s telling you that it’s time to die. It’s 6:30 p.m. in eastern Arizona, and an energetic doctor who has gained notice due to his disdain for vaccinations has just gotten home. It’s been a busy day. He’s already spoken to USA Today. He just did a segment on CNN. And he’s closely monitored his Facebook page, which has collected 4,000 “likes” in the span of 48 hours. But Jack Wolfson always has time to discuss vaccinations — his hatred of them and his abhorrence of the parents who defend them. Not inclined to being mean-spirited, it is not my wish that Doctor Wolfson ever comes down with the measles.